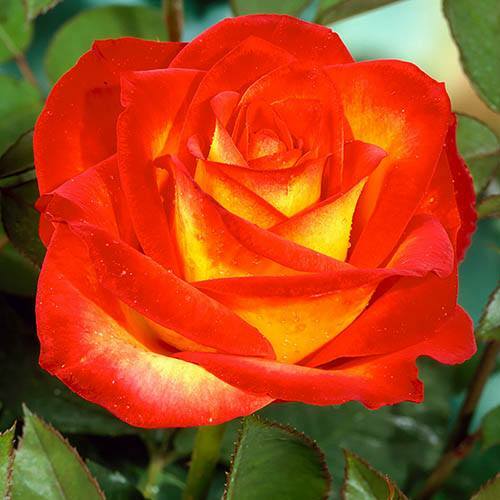 Scorching red and orange blooms make this an unusual colour rose and worth a place in any garden. Fill your garden with the sensational, fiery blooms of Rose 'Alinka'. A stunning floribunda rose with its scorching blooms and light, delicate fragrance. An upright and bushy shrub with dark green, glossy leaves, its medium to large bi-coloured flowers open from scarlet-red buds into a sunset combination of rich red and golden yellow. Blooms start in late May and continue right into the last warm and sunny days of autumn. Supplied as a bare-root shrub, Alinka will grow to around 1-1.2m. A traditional rose bred back in the heyday of rose gardening during the 70's when every garden had a favourite rose bush, and bright colours were a must-have. Alinka is a beautiful floribunda rose and certainly caught the eye of our growers with its scorching blooms and light, delicate fragrance. Its medium to large bi-coloured flowers open from scarlet-red buds into a sunset combination of rich red and golden yellow and the blooms start early in the season – in late May – and continue right into the last warm and sunny days of autumn. An upright and bushy shrub with dark green, glossy leaves, Alinka will grow to around 1-1.2m producing blooms which are perfect as cut flowers. Supplied as a bare-root shrub, ready for planting out now. 1 x Bare Root Rose, ready to plant out now. Dig a hole twice the width of the roots, forking over the bottom to loosen the soil, and add some good quality fertiliser such as Blood Fish & Bone (wash your hands afterwards!). Plant so that the graft union (the swollen area when the stems meet the roots) is around 3cm below soil level.